From 1943 until 1945, Grand Junction, Colorado was the center of the Manhattan Project’s secret effort to mine and refine uranium ore from surrounding mills in the Colorado Plateau. By 1946, over 2,600,000 pounds of uranium oxide had been produced from Colorado Plateau material, representing 14 percent of the total uranium acquired by the Army Corps of Engineers’ Manhattan Engineer District (MED).​ The demand for uranium fostered the growth of towns such as Uravan, Colorado; Durango, Colorado; Moab, Utah; Grants, New Mexico; and Jeffrey City, Wyoming. Christened “yellowcake towns”, due to the cake batter consistency of refined uranium, these mining communities on the Colorado Plateau were instrumental to the development of the atomic bomb. The impetus for mining radioactive ores out of the Colorado Plateau began in the late 19th century after carnotite was discovered in the mesa. Carnotite is a mineral with a greenish yellow appearance typically found in sandstone. During the 1930s and 1940s, it was mined by the United States Vanadium Company (a subsidiary of Union Carbide and Carbon Corporation) and the Vanadium Corporation of America for its deposits of radium and vanadium. The milling of carnotite left tailings that contained remnants of uranium. Whereas vanadium strengthened steel and radium was used for its perceived healing capabilities, uranium was considered useless until the discovery of nuclear fission in 1938. Albert Einstein and Leo Szilard’s s subsequent letter to President Franklin D. Roosevelt launched plans for the Manhattan Project and the ensuing pursuit for uranium. Fears about Germany’s control over Czechoslovakia’s uranium mines facilitated the United States’ enhanced search for enough of the element to develop atomic weapons. The MED secured 86 percent of its uranium from deposits in the Belgian Congo and Canada, but General Leslie Groves insisted that an effort be made to obtain uranium from domestic sources. In 1942, Groves ordered the vanadium-processing mills in the Colorado Plateau be considered as possible sources of uranium. After discovering unused uranium in tailing piles throughout the region, the MED purchased tailings from the Colorado milling towns, Narurita, Durango, Slick Rock, Gateway, and Loma. 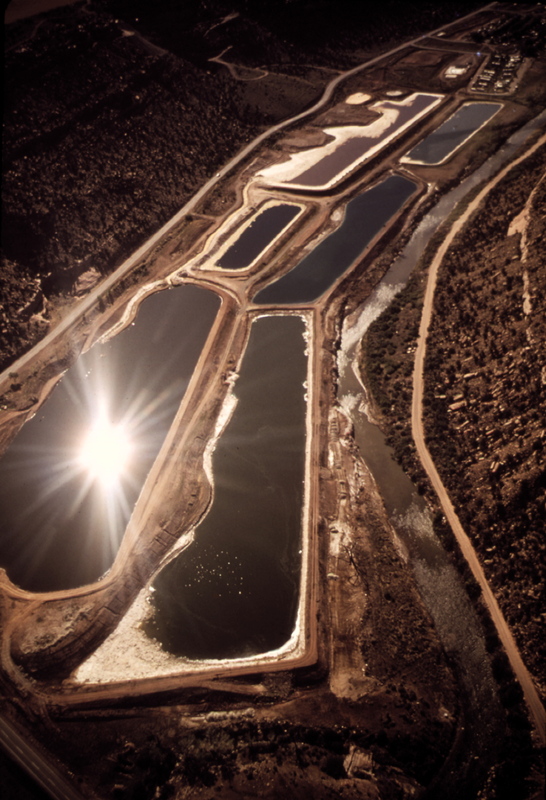 Additionally, the MED offered confidential contracts to the Vanadium Corporation of America (VCA) and United States Vanadium Company (USV) to reprocess the tailings into uranium sludge. Groves assigned Second Lieutenant Philip Leahy to establish a domestic uranium procurement program in Grand Junction, Colorado. When Leahy arrived in Grand Junction on March 23, 1943, he purchased a $10,500, fifty-five-acre gravel mine as the site to establish a uranium refinery, due to its proximity to the Gunnison River and railroad access. Leahy split his time between an office in downtown Grand Junction and the headquarters established in an old log cabin nearby. With no mill of its own to process the material, the MED signed a top-secret contract with the United States Vanadium Corporation to operate its plant in Uravan for uranium procurement. The MED agreed to build an additional mill to help process the material. Beginning in May 1943, the region’s uranium ore would be brought to Uravan and run through the plant to produce three tons of green uranium “sludge” per day. This material was then transported, along with similar sludge from USV’s mine in Durango, to the MED’s newly constructed refinery in Grand Junction. Groves initiated a study to assess the various worldwide deposits of uranium and thorium in anticipation for future atomic production. The Manhattan Project collaborated with USV’s parent company, Union Carbide and Carbon Corporation, to create the Union Mines Development Corporation (UMDC) as a front to avoid suspicion. The UMDC operated as a subsidiary of Union Carbide under the pretense of a large international mining company interested in tungsten, molybdenum, and vanadium. To accomplish this undertaking, Union Carbide established a department for UMDC in its Manhattan building and a field office in Grand Junction. Groves selected Major Paul L. Guarin to lead the UMDC operation. Guarin’s background as a member of the Corps of Engineers and experience as a geologist for the Shell Oil Company made him an ideal candidate to direct Union Carbide’s task force. From 1943 until 1946, the UMDC examined all available literature on recorded occurrences of uranium ores and conducted field examinations in more than thirty-six states and twenty foreign countries—a majority of these in the ore reserves of the Colorado Plateau. The UMDC clandestinely surveyed uranium sites until the Atomic Energy Commission (AEC) took over in 1946. Grand Junction, Colorado is an essential site in atomic history. The city’s refinery operated as the only domestic uranium procurement site from 1943 to 1946. In 1947, the AEC established the Colorado Raw Materials Office at Grand Junction, which became the primary office for uranium research during the Cold War. The office was responsible for the development of experimental uranium milling and processing techniques in the Western United States. Over the years, work with these radioactive materials contaminated the surrounding environment. Radioactive waste from the pilot mills and sampling plant buried onsite leached into the groundwater and polluted the Gunnison River. Since the 1980s, the Department of Energy (DOE) has engaged in efforts to clean up the radioactive contaminants by identifying and decommissioning infected areas. In 2016, the DOE submitted a proposal to add the Grand Junction Office to the National Register of Historic Places. The log cabin was transformed into a learning center to host tour groups, display artifacts from the site, and interpret Grand Junction’s nuclear history. J. P. Moore worked as a chemist for US Vanadium Company and then as Chief Chemist at Grand Junction, where he analyzed uranium. The full transcript can be found on "Voices of the Manhattan Project."